This plays like a cross between a traditional audiobook and an old time radio show. Not quite either, this is the best multicast performance I've ever seen from Audible Studios. Enriched with sound effects, music, and few little tricks that harken back to the days of the Shadow radio show, this one is a tremendous amount of fun. Now, you have to understand what you are getting here. This is an original pulp novel from the 30's so the prose is a bit over the top, but fun? Oh boy, is this fun. Unleash your inner 10 year old for a few hours and enjoy this. I certainly hope Audible studios does more of these performances/readings with a full cast. There are more than 300 novels featuring the Shadow to choose from and the Doc Savage stories would lend themselves to this kind of treatment as well. C'mon Audible! You are on to something here! Keep them coming! I was so surprised to see this up on audible. I never understood why there were no audiobooks of The Shadow Pulp novels. Hopefully this is just the beginning. Bring on the remaining 324 books! a fun listen. can see where Kaluta got his inspiration to do a batman-shadow story in the 70s. I grew up listening to radio dramas at my grandparents. They always were exciting. This brings back memories of those times. Ever since I was a kid I loved The Shadow and now to be able to listen to these books, it rekindles that fascination with this character and his stories. I found the story very interesting, absolutely love the detective style/ mad scientist. the narrator did a fantastic job of telling the story, it was kind of like listening to a ghost story by a fire. this book would definitely not be the same without its dramatization, the cast was fantastic as well as the sond effects. overall I loved the book and I hope and pray that they do all of Maxwell grants works in this fashion! Thank you! The Shadow knows...and so will you! A talented cast of performers does a great job of bringing The Shadow, his agents, and a splendid group of villains to classic pulp life. Bravo! 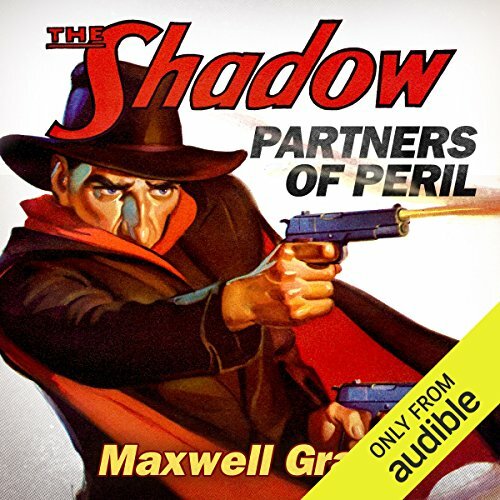 What made the experience of listening to Partners of Peril (The Shadow) the most enjoyable? This was just what I needed. Strait forward, exciting, short, and fun! The main narrator was the best, really you wouldn't have needed the full cast, but they were icing on the cake. The main narration had the perfect pulp voice. Pleasepleaseplease release more of these!